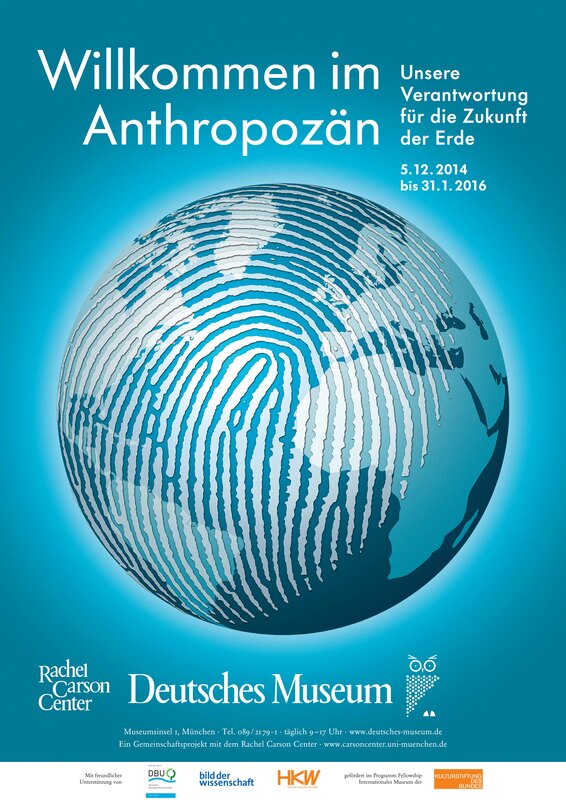 Together with the Deutsches Museum, the Rachel Carson Center created a major special exhibition “Welcome to the Anthropocene: The Earth in Our Hands,” which opened on 5 December 2014; it was extended until 30 September 2016. The endeavor is based on a proposal by Prof. Dr. Reinhold Leinfelder developed during his fellowship at the Rachel Carson Center and the book Menschenzeit by Christian Schwägerl. Both Leinfelder, in his function as affiliated Carson Professor, and Schwägerl were involved in the conceptualization process of the exhibition. Partnering in the exhibition was the Haus der Kulturen der Welt in Berlin which focused on the topic with a diverse range of programs in 2013 and 2014. Coined by the atmospheric chemist and Nobel Prize laureate Paul J. Crutzen, the term “Anthropocene” describes the idea of a new geological era following the Holocene that is shaped by the deep interventions into nature by humans as bio- and geological agents. As a scientific hypothesis, the Anthropocene entails the idea that the changes initiated by humans show up in geological evidence and that they have such a long-term impact that they should be recorded on the earth’s history scale. Beyond this geological interpretation, the Anthropocene denotes a new framework of thinking and action, which builds a bridge between the natural sciences and the humanities and which interlinks the history of our planet and humankind with the present and future. In the tradition of the Deutsches Museum, the exhibition displays both historical artifacts and current objects from scientific and industrial laboratories and engages the audience by means of interactive demonstrations and direct participation through digital media. Both the exhibition and an accompanying broad program of events offer the public a unique opportunity to share available knowledge, pose questions, evaluate answers, and form opinions. The exhibition was extremely successful, with an average of 8,500 visitors per month, or around 10 percent of total visitors to the Deutsches Museum. In its closing month, more than 22,000 people visited the special exhibition. The project manager/curator for the Anthropocene exhibition is Dr. Nina Möllers. For more information, please contact her at n.moellers@deutsches-museum.de or +49 (0)89 2179 284. Visit the Deutsches Museum website for more details on the exhibition. An exhibition catalogue was published in German and English; it was awarded the Deutsches Museum’s Publikationspreis for 2015. The RCC's Environment & Society Portal also profiled the exhibition with a series of online comics and an accompanying digital companion. For other RCC events and collaborations on the topic of the Anthropocene, please click here.